When I was younger, I remember seeing footage of concerts such as Metallica (or any other popular band from the 80s or earlier) and noticed that they still sell out huge shows and that much of the crowd were older folks. This was in the early 2000s and my teenage mind couldn’t quite comprehend why such bands were still huge and why these fans haven’t moved onto newer music. Now being a bit older I realize that I’m no different. I too would much rather listen to some of my older punk albums than the new music being made these days. I think it’s natural for most people to care less and less about new music the older they get. To a kid only burdened by homework, a part time job and possibly a girlfriend and video games, life isn’t too complicated or hard. Going to shows and keeping up with the latest news on the music scene was a priority to many during those youthful years. As you get older, responsibilities, obligations, long term goals, and other interests tend to push music on the back burner. So when they do decided to listen to something, most people would prefer a nostalgic tune from their younger years. Don’t get me wrong though, there are definitely some new tunes that catch my ear and they find their way into my music collection. They just tend to be few and far in between nowadays. So that being said, most of my musical recommendations will most likely be from the late 90s or early 2000s and if you happen to be in your 30s and like punk, industrial, or hard rock, you might just enjoy them too. Looking through my music collection, punk rock is definitely more prominent than other genres. I tended to lean towards punk for its energy. Fast drumming coupled with screeching guitar just caught my ear more than anything. Throw in some satirical commentary and immature puns and I was sold. Bands like NOFX, The Vandals, Descendents, Tiger Army, Propaghandi, and Strung Out were such a staple of my music collection growing up. Despite so many albums that I’ve repeatedly listened to back in those days, there were virtually none that I could listen to every track and call it a perfect album (unless you include NOFX’s “The Decline”, but that’s cheating as it’s the only track on there and it’s a great song). 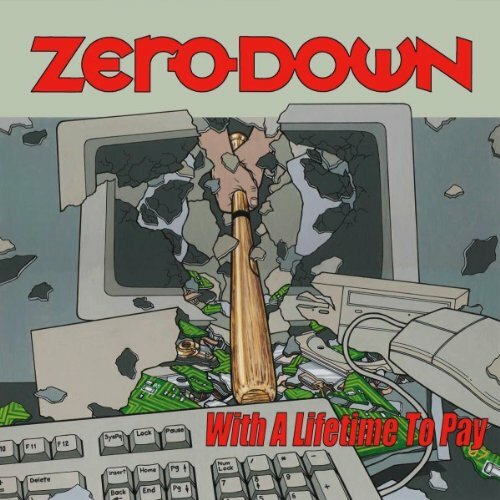 The closest album that truly can listen to from start to finish I would have to say is Zero Down’s “With a Lifetime to Pay”. There are many albums in my collection that I simply don’t listen to anymore. Sometimes, I only put my favourite songs from a record onto my iPod, and sometimes just a few songs from a band all together. Hell, there are some bands I don’t even have on there anymore and haven’t had an urge to listen to in years. That’s not the case with Zero Down. Every few years I find myself pulling this one out when I’m walking my dog, biking, or at the gym. And when I do throw their songs back on my iPod, the whole album goes on, nothing is missed. As I pointed out early, I tend to like the immaturity many punk bands incorporate into their lyrics, however Zero Down doesn’t do this. Some songs focus on social commentary such as The Way It Is, Bite the Hand That Feeds, Empty Promised Land, and A Million More. While other tracks such as No Apologies, Going Nowhere, It Ain’t Over Yet, and Self Medication shift their focus on self-reflection. But given the quality of their sound I don’t mind a lack of humor, more mature lyrics work better in this case. But to me, the two strengths of this album are purely instrumental. I find they deviate from your usual punk band by utilizing melodic tunes with their guitar and bass as well as Jim Cherry’s choruses (not to mention he has a great voice that perfectly suits the more serious topics he sings about). Second, the drumming is not in typical fashion either. While the drumming is fast, there are definitely sections in this album where they get creative with it. If you put all these together; the melodies, the rhythmic drums, the lyrics and Cherry’s voice you get a unique and great punk rock album. This is an album even people who are not fans of punk rock can enjoy and it doesn’t sound like a punk band that’s purposely tailored for radio. You would think my first music recommendation would be my favourite album from my favourite band, but this isn’t my favourite album of all time, nor is Zero Down my favourite band. In fact I don’t know if I can even pick a favourite, but if I did this would be a heavy contender. I chose this one because of the fact that I find myself pulling this one out every few years and listening from start to finish for a few weeks. There are not many albums that I know of where I can do either of those, let alone both. Sadly singer Jim Cherry died early in life at age 30 and Zero Down disbanded due to this. “With a Lifetime to Pay” was their only album made and alone it gave me countless hours of bliss. A must listen for any music fan. This entry was posted in Recommendations and tagged Music, Punk Rock, With a Lifetime to Pay, Zero Down. Bookmark the permalink. What’s worse than having to reload and having an enemy run at you with a knife?